The countdown to end ENDO and contractualization continues: 26 days. Now it's the turn of women workers to demand from Labor Secretary Silvestre Bello III the immediate release of a new department order ending contractualization in all its forms, a couple of days before International Women’s Day. They marched from Taft Avenue to the Labor and Employment offices in Intramuros, Manila. Labor groups led by Nagkaisa on Thursday, challenged Sec. Bello to once and for all put an end ENDO (end of contract) or contractualization, the illegal practice of employers of dismissing workers to avoid their regularization. They also want an end to employers’ exploitative manpower agency and cooperative hiring, in lieu of direct hiring to avoid the granting of full benefits and tenure to employees. In a meeting with labor leaders last week, President Rodrigo Duterte renewed his commitment to stop contractualization and directed the DOLE secretary to release an issuance consistent with his stance. Half of the women working population are performing unpaid family work—household chores and taking primary responsibility for rearing the children. Women workers represent 40.1% of laborers and low skilled workers, who account for 30% of the labor force. “The clock is ticking. The Secretary has 26 days to implement the marching orders from Malacanang. 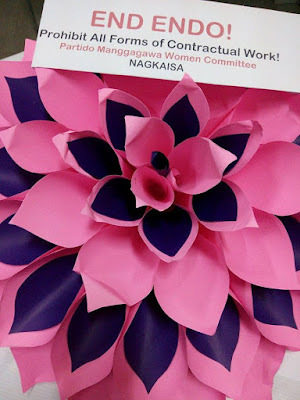 Should he fail to stop contractualization, he would have to answer not only to the President, but more importantly he should be accountable to women workers who have been victimized by contractualization across the country,” the Nagkaisa Women Committee said. Coordinated action by women workers in other parts of the country are also expected, the Nagkaisa Women Committee said. Women workers are also calling for the Philippine ratification of International Labor Organization Convention 151, an international labor standard that recognizes the rights of public sector workers to freedom of association and collective bargaining. More than half (52%) of public sector workers are women. While both women and men are equally affected by contractualization, women suffer greater consequences. “Pregnancy is an unwritten convenient excuse to end the job contract of women so employers can avoid giving maternity benefits,” the Nagkaisa Women Committee said. This gender bias is extended to the non-regularization of nursing working mothers who can demand 40-minute lactation breaks to express their milk at lactation stations in the workplace, for every eight hours of work. “Even women who avail of up to two months of paid gynecological leaves for surgical procedures done within their reproductive system, suffer discrimination at work as they are seen as additional cost for the business,” the Nagkaisa Women Committee added. This is deeply rooted in structural inequities and historical gender-based inequality such as in the areas of the wide gender pay gap and equal opportunity for promotion. At the international stage, the women’s movement has also gained significant ground, thanks to the highly successful ‘Women’s March” in January. According to the International Trade Union Confederation (ITUC), the surge in populist misogyny threatens to reverse progress towards gender equality and women’s autonomy – from austerity and privatisation of public care services to increasingly precarious and informal work, from a resurgence in patriarchal attitudes to attacks on women’s reproductive and sexual health and rights. “We remain firm in our determination to secure high quality, decent work for women and an end to the gender wage gap ande we remain committed to ending the discrimination and violence that affects women’s daily working lives,” ITUC said.